Aaron Na and his recently retired commuter bike. Photo courtesy Aaron Na. Cycling Utah: Aaron, tell the readers a little about you. Aaron Na: I'm a deaf man. I have lived in Utah off and on for years. My family is usually car-oriented, but when it comes to recreation, we ride the bicycles when the weather favors. I am the eldest brother of my family. A.N. : I commute because it's a cheapest option without having to pay the standard bills, such as insurance and maintenance, and fuel expense associated with owning the vehicle. I began bike commuting in 2005 in Arizona when I lived in that state, because I didn't have the car. I ride for quick commuting, exercise, and frugal (spartan) lifestyle, not to mention the thrill it gives me to ride the bicycle amidst the motor vehicles in traffic, with the right of way. C.U. : Where do you bike to and from? What are the highlights of your commute and what are the more difficult parts? A.N. : There are various destinations. 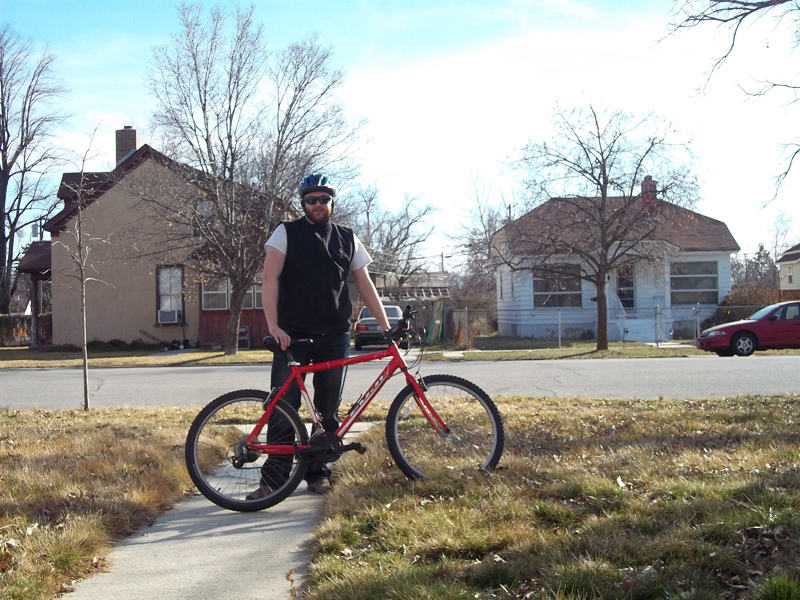 The highlight of my commuting is traveling by bus or train to Salt Lake City and use the bike to commute, which is more convenient and fun, especially with the green-striped bike lanes on Main Street and elsewhere that gives me a sense of the right of way as a bicyclist. Another is riding the bicycle down the hill on the road, which provides relaxation and relief, after pedaling on a long trip. The difficult parts are riding uphill, which typically necessitate walking with the bicycle to spare strenuous pedaling that's all struggling, and having to contend against the traffic with obnoxious and attention-defective drivers, especially at the corners of the intersection without deference to the right of way and block me from proceeding at the “walk” crosswalk sign. I'm sure this is a common peeve among the seasoned bicyclists and pedestrians. C.U. : Your sister is also a bike commuter. Do you compete with her to see who commutes more? Do you trade tips about equipment or talk bikes very often? A.N. : We usually don't compete who commutes more; we never discussed this idea. I have ridden in the worse weather, like rain, snow (icy roads), and strong wind. I once had a contusion to my hands after falling due to the chain that broke off because the gears and chain were not adequately oiled. I learn the lessons; be sure to take care of your bicycle even if it's well worn and beat-up, because it could get damaged to cause the crash by collapsed chain. Wear the helmet. My sister and I don't trade tips on equipment, but we have talked about the bicycling briefly sometimes. We rode together to and from BYU LaVell Edwards Stadium to attend the Stadium of Fire, 3-mile one-way trip. There were the others who rode the bikes as well, but the good part is we rode the bikes besides the jammed car traffic on one street with extra challenge of avoiding collision and being alert of obstacles and sudden change of direction. C.U. : What type of bike do you commute on? A.N. : I commute on the red-framed Fuji Odessa 2.0 bicycle with multiple shift gears. I bought this bike in Rochester, New York in autumn 2009. I bought the pair of black metal baskets. I put the pair together with the assistance of a clerk at Home Depot. I had received numerous compliments by strangers on the street upon seeing the pair of metal baskets, open while carrying or closed. This gives me the feeling of satisfaction that bike commuting is well worth the effort as an alternative to owning and operating the car for financial and personal belief reasons. C.U. : Do you do anything special to accommodate for your hearing loss? A.N: I was deaf from birth. I use hearing aids, but not frequently. Having a cochlear implant is too cost prohibitive. I use hand signals but not often. If the traffic is heavy, I utilize hand signals more frequently. However, not many drivers understand hand signals including right-turn and stop. I just need to be more aware of my surroundings with scanning including looking back before taking the turn. C.U. : So basically you do not find yourself riding any differently than a cyclist without hearing impairment? A.N. : To answer your question, there is no adaptation, except I have to contend with my lack of hearing by being cautious and alert of surroundings, which I'm sure the hearing counterparts does. C.U. : Is there any network of deaf cyclists to your knowledge? A.N. : I don't believe there exist the deaf bicyclist network in this state. It's probably prevalent in populated states like California and New York. I have a cycling friend at the Utah Valley University. C.U. : You said that “the thrill it gives me to ride the bicycle amidst the motor vehicles in traffic, with the right of way.” Can you go into more detail about the “thrill”? A.N. : The nature of a thrill is it gives me a degree of control while putting my body to purpose with moderate exercise against the weathers, favorable or adverse, that elevate fun. My idea of thrill is being defiant towards the strenuous, competitive, obnoxious and overpopulated “car culture” with my right of way including using the road responsibly and safely (including rear and front light at night for alert), to remind the motorists I exist as the commuting bicyclist, even if they call me a “loser” for riding the bicycle on the edge of the right lane that force them to move a little to the left to allow space, even in tremendously busy traffic on the weekends with BYU home games, as is the right of way. C.U. : Thanks Aaron. Your story is inspiring.